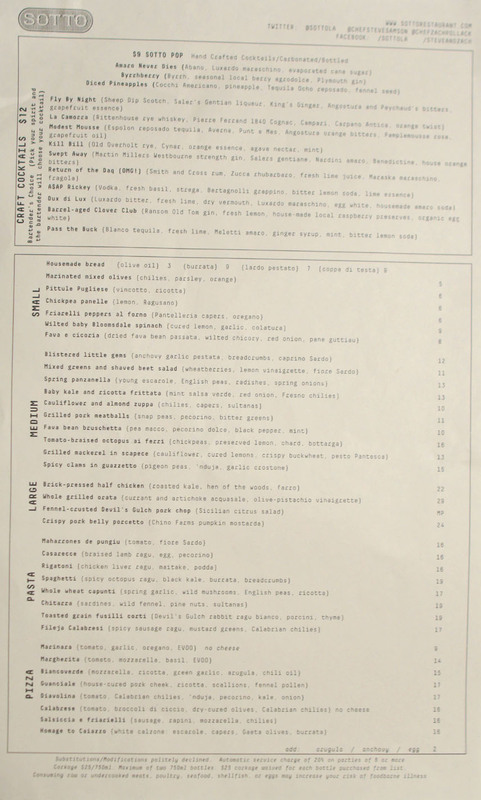 When it opened two years ago, Steve Samson and Zach Pollack's Sotto made quite a splash on the Italian scene here in LA, offering up a chef-driven restaurant dedicated to the bounties of Southern Italian cooking. Personally, I was rather smitten by this keenly regional approach to the cuisine, and figured that it was a time for a revisit. 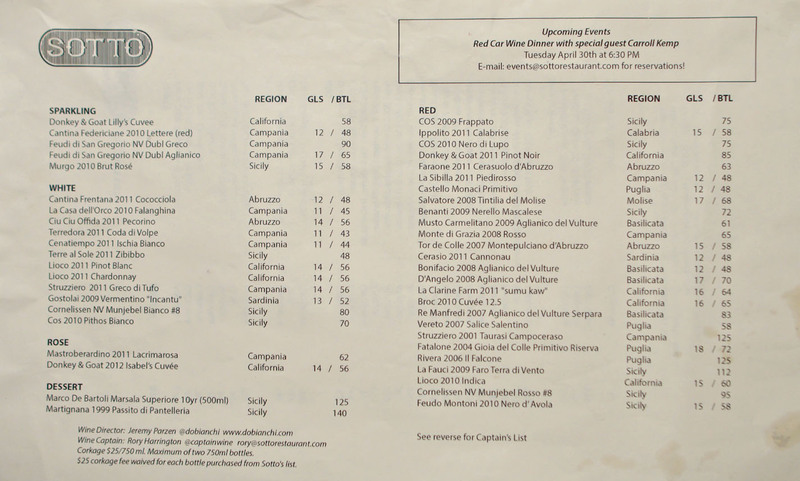 Sotto's menu remains firmed rooted in Southern Italian traditions, and features a line-up of standbys (e.g. 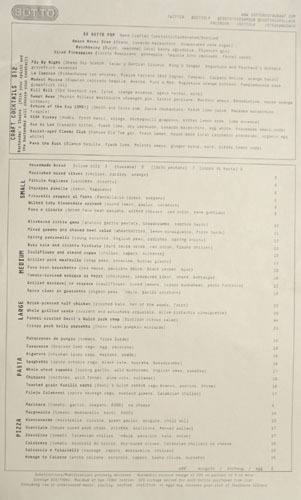 the octopus and mackerel) joined by a rotating selection of new creations. 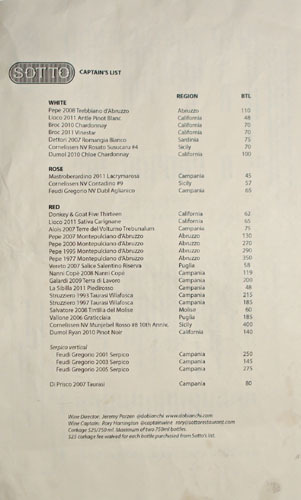 To drink, you can't go wrong with the cocktails here, while the wine list--curated by Wine Director Jeremy Parzen and Wine Captain Rory Harrington--features a smart selection of eclectic, reasonably-prices vinos from Italy and California. Click for larger versions. Bread is baked in-house using residual heat from the restaurant's vaunted pizza oven, and arrived toasty, smoky, and charred. 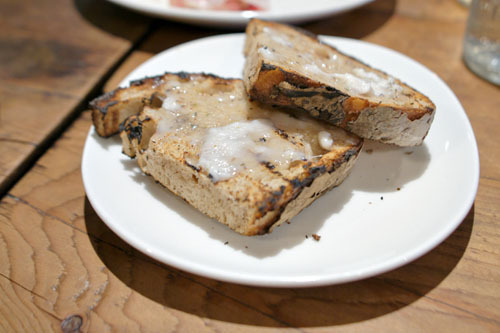 It was tasty alone, but you have to try the various toppings, the most famous of which is the lardo pestato, affectionately known as pork butter. 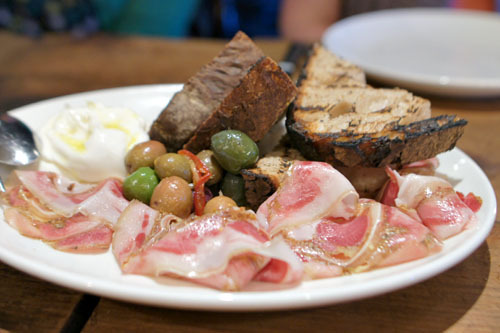 The spread was as satisfying as it sounds, but the burrata was on point as well, and the coppa di testa was marvelous: slick, spicy, fatty, and just brimming with pork-y sapor. Next up was Sotto's signature snack of Sicilian chickpea fritters. They were fun little bites, crisp on the outside, fluffy on the inside, loaded with a straightforward savory character, amped up by the salty Ragusano, and topped off by a hit of lemon-y tang. 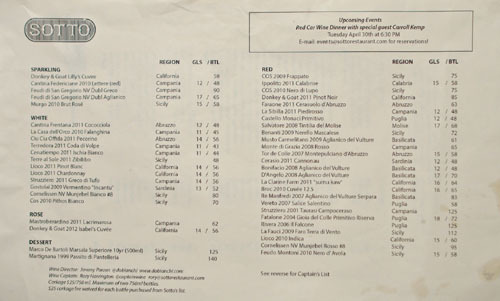 Sotto's cocktail program--the work of Julian Cox and Nick Meyer these days--has always been worthy of praise, so naturally we had to have a few to begin. 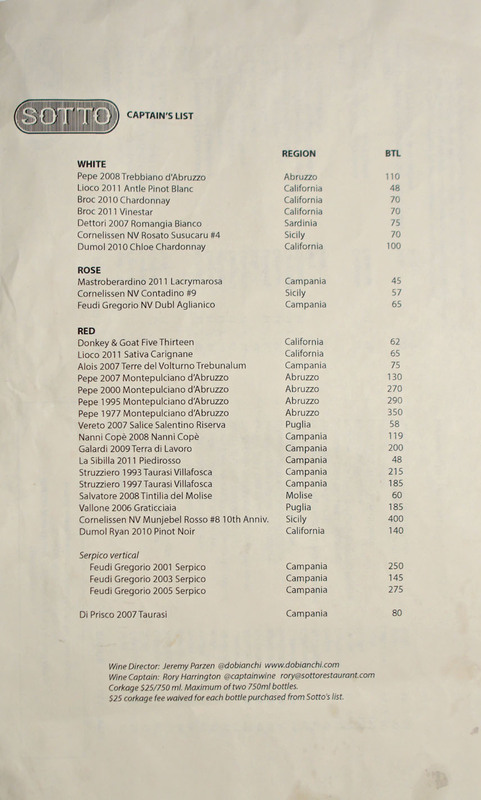 Based on our server's recommendation, I went with the La Camorra and wasn't disappointed. It was a stout concoction, classic in essence with a great balance of boozy, bitter, and sweet-aromatic flavors perked up with just a bit of citrus-y flair. 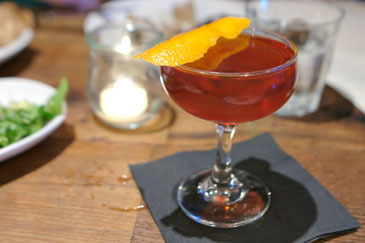 The Fly By Night was a success as well, with a slight smokiness and a lovely mix of ginger and grapefruit nuances. My favorite of the bunch was the Return of the Daq (OMG! 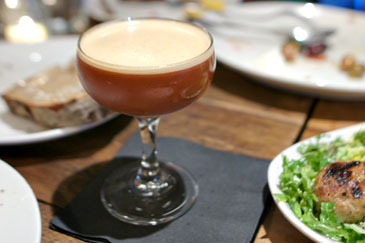 ), a riff on the daiquiri that served up a perfect balance of sugary and astringent flavors over a base of Smith & Cross. 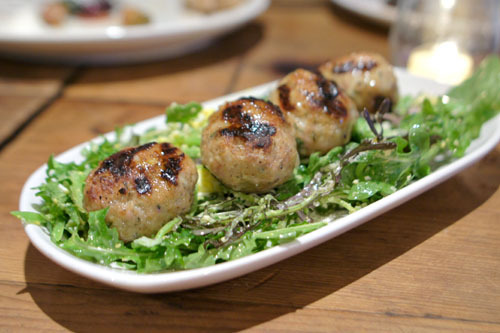 I normally shy away from ordering meatballs, often finding them uninspired, but my god, these were the best I've ever had. They came out utterly juicy and brimming with piggy goodness, offset by just a whisper of char. The meatballs were fantastic alone, but I appreciated the tempering effect of the greenery here as well. You need to get this. 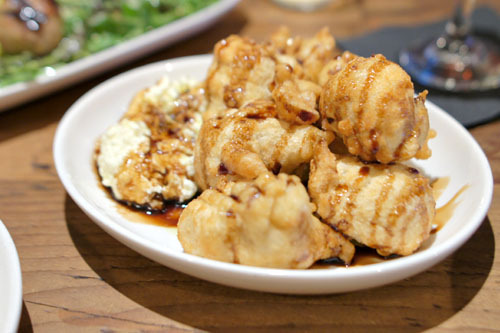 Next up were globules of fried dough--dense, filling nuggets with a savory yet slightly sweet taste to 'em that paired well with the sweet vincotto (grape must condiment) and creamy-cool ricotta. 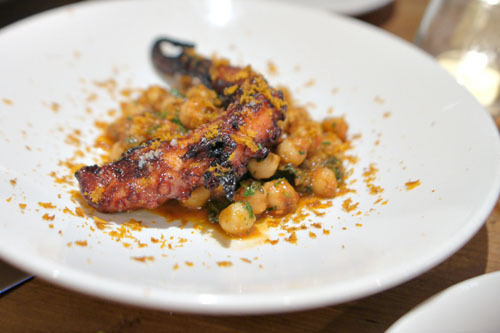 Between this and the version at Bestia, I gotta say that the Italians have got a way with polpo. It was flawlessly cooked, coming out tender, yet still with a bit of bite and a wonderfully crisp crust, redolent of smoky char notes. The bottarga, meanwhile, served to amplify the natural brine of the octopus, and I loved the moderating effect and textural play of the garbanzos as well. A must-try. Our first pasta was of the rolled variety. The casarecce arrived properly firm to the bite, and worked flawlessly against the hearty, meaty ragu, while the egg and cheese added further lusciousness to the dish. Hard not to enjoy this one. 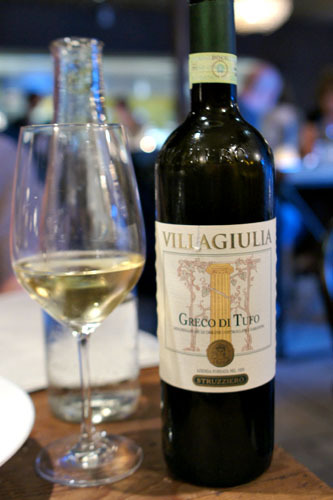 We transitioned from cocktails to wine, the first of which was the Struzziero 2011 Greco di Tufo [$56] from Campania. I quite liked this one, with its marked stonefruit flavors on the tongue joined by dry, herb-y notes that made for a very balanced wine. 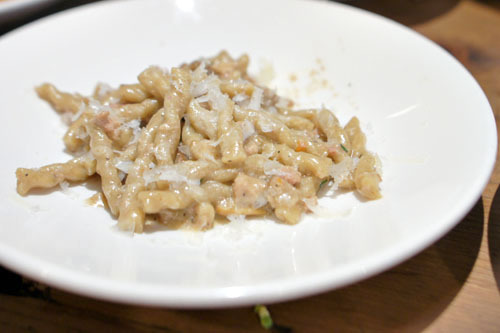 "Short" fusilli are a treat from Calabria and showed off a delightfully hearty, nutty character that I adored. The pasta was a perfect match to soak up the comfy, cozy flavors of the rabbit sauce, which I found simply delicious, with a hit of earthiness from the porcini and a great aromatic component from the thyme. Spaghetti was well-executed as well. 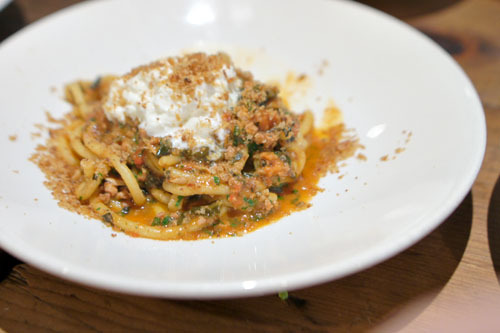 The spicy ragu worked wonders here, beautifully countered by the astringency of the kale while the burrata added a palpable luxuriousness to the dish. Pizza is naturally a must-order here, and the guanciale variety is one of the more popular selections available. For me it starts with the crust, properly bitter and leopard-spotted, with a blend of crisp and fluffy textures. 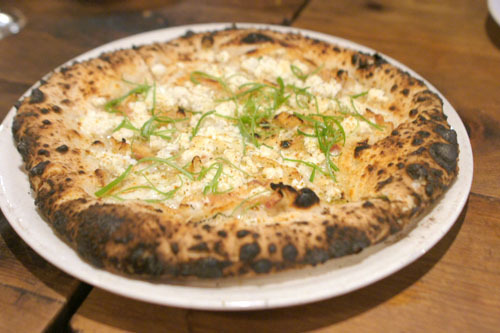 To that, the pork cheek imparted a focused saltiness to the pizza that paired swimmingly with the lush chunks of ricotta sprinkled on top, all while the fennel and scallions offered up a bit of the levity to the mix. 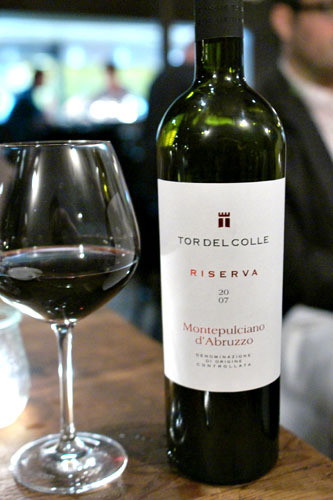 To go with the heavier courses, we opted for a bottle of the Tor de Colle 2007 Montepulciano d'Abruzzo [$58]. This one was quite pleasing as well, dry on the palate, with a tannic quality to it and a marked berry fruit character joined by a peppery spice. It stood up nicely to the food. 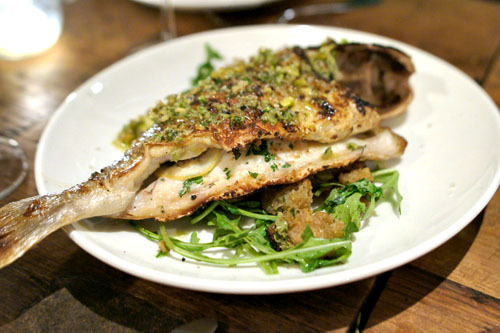 Gilt head bream was masterfully presented: tender and moist, with a particularly savory skin and charming brininess to it that melded surprisingly well with the tangy acquasale. In sandwich form, the porcetto is perhaps Sotto's signature item at the moment, available during lunch only. Less well known, though, is this version of the delicacy, served only on Sundays we're told. 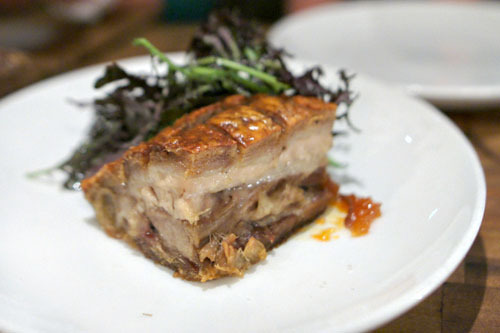 It's similar to its better known cousin porchetta, but not quite the same, being traditionally made from a slow-roasted, salted and herbed suckling pig. Differences notwithstanding, the end result is a contrast of tender, fatty, immensely flavorful flesh and wonderfully crunchy, salty skin that satisfies your basest cravings. A dab of mostarda added a hit of piquancy to the dish, and the greens a certain levity, but clearly, the pig was the hero here. Time for dessert. There is no dedicated pastry chef here, so the sweet stuff comes from the two Chefs as well. Click for a larger version. 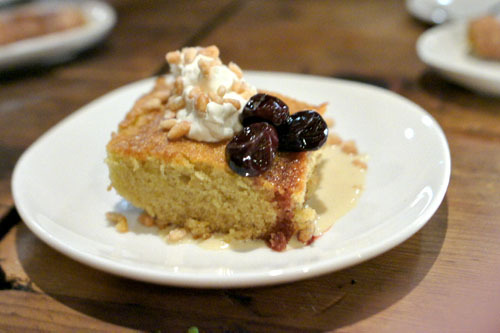 The olive oil cake was pretty phenomenal, one of the tastiest I've had no doubt, with its slight savory character flowing beautifully into the sweetness of the pine nut crema and whipped cream, all while the grapes added an unabashedly sugary smack to the dessert. Really well balanced. 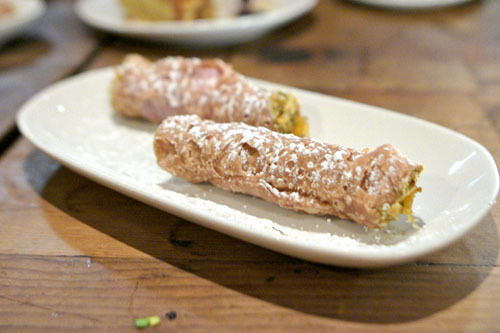 A Sicilian treat, cannoli comprise rolled tubes of fried pastry, stuffed here with a mixture of ricotta, pistachio, orange, and chocolate. It was a paradigmatic presentation of the dessert, with the crisp dough playing off of the orange-chocolate nuances beautifully, all while the ricotta served as subtly sweet base to the course. Our party closed out with Sotto's tart-like crostata. 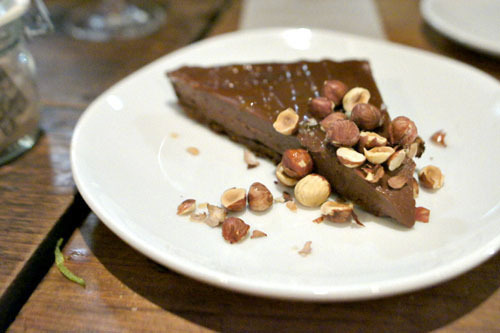 Here we're talking rich, lush, chocolate-y flavors joined by a savory, herby element from the rosemary caramel, all while the hazelnuts offered up a nutty crunch to the fray. 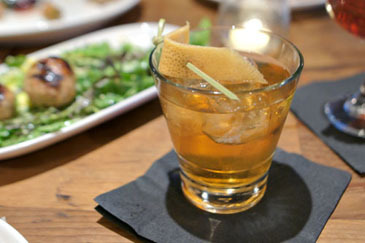 Sotto's going as strong as ever, with Pollack and Samson serving up some of the most unique, and delicious Italian cooking in the Southland. I love the duo's focus (or obsession, more appropriately) on the southern reaches of the country, which allows them the latitude to present to diners some of the region's lesser known delicacies, a blend of rustic and refined that makes me feel thankful that we have a place like this. 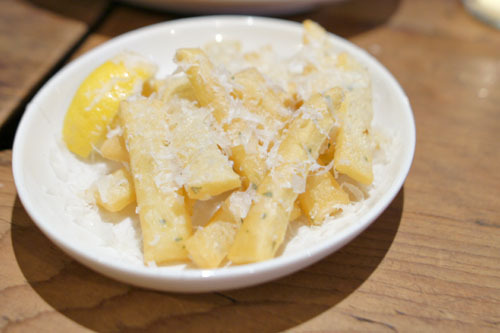 Definitely a star in LA's Italian repertoire. is it possible to order the pasta without the cheese, it just seemed like the cheese dominated the flavor. 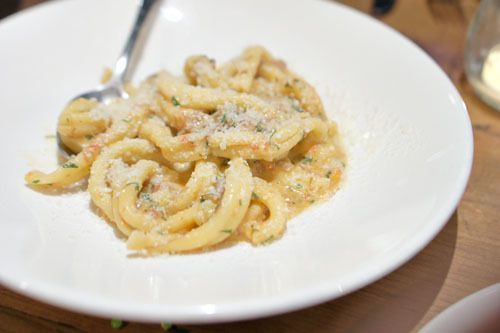 Italian food in Southern California seems kind of...monotonous and dull. Every 'hip' place seems to be serving the same things. Dudetb3: Why would you think that? The cheese wasn't domineering at all. Anon: What kind of stuff would you like to see instead?